2007 Slide Show - TubaChristmas Pittsburgh Pa. Calling All Low Brass Players ! 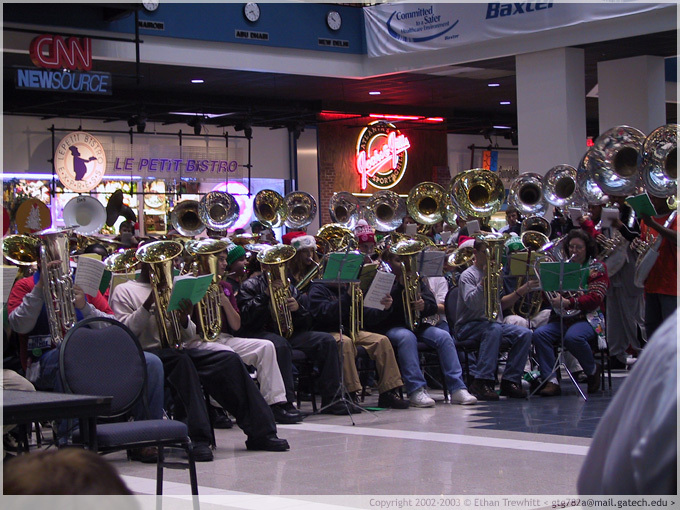 The TUBACHRISTMAS Concert In Pittsburgh, Pa. And Throughout The World ! 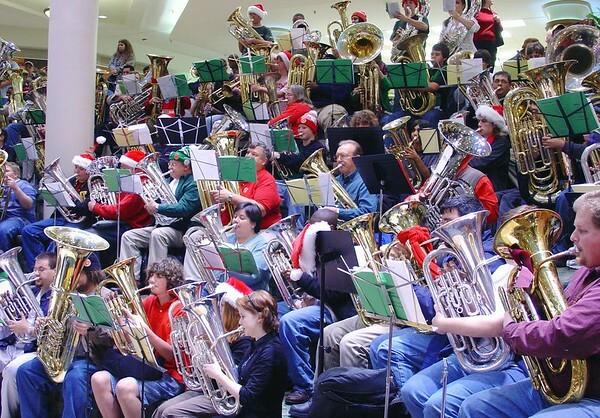 Help Achieve Maximum Participation For Your Area's TUBACHRISTMAS Concert. Your Efforts Will Be Appreciated By Tuba And Euphonium Players Everywhere. Sometime Between Thanksgiving and Christmas. However you will have to transpose the music to "G"
Drum Corps People, Remember That Your Horns Project Directional Sound. Throttle Back a Bit When Playing With Horns That Have Bells That Face UP. 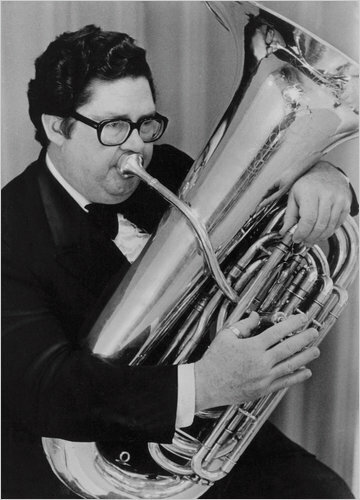 What Does A Band Made Up Of Tuba, Euphonium And Baritone Sound Like ? Here are the MIDI Files for the first 4 songs in the book. Click On Numbers To Play 1. 2. 3. 4. What Do I Need To Participate ? This is similar to what happens in Pittsburgh ! Attention All Drum And Bugle Corps Low Brass ! TubaChristmas Music Transcribed For "G" Bugle Is Here ! Courtesy Of TubaDon From "So Cal Dream Drum And Bugle Corps"
For more information: Visit www.tubachristmas.com, or contact Aaron Booz, coordinator, at aaronbooz@gmail.com or 412-212-8808. Music Books are $20 ($25 for large print), on sale at the event and through the website at www.tubachristmas.com/order.pdf. Registration is $10.00. Bring a music stand, wear bright colors, and feel free to decorate your instrument for the season. See you there! Each registrant will receive a TUBACHRISTMAS 2015 Commemorative Button. 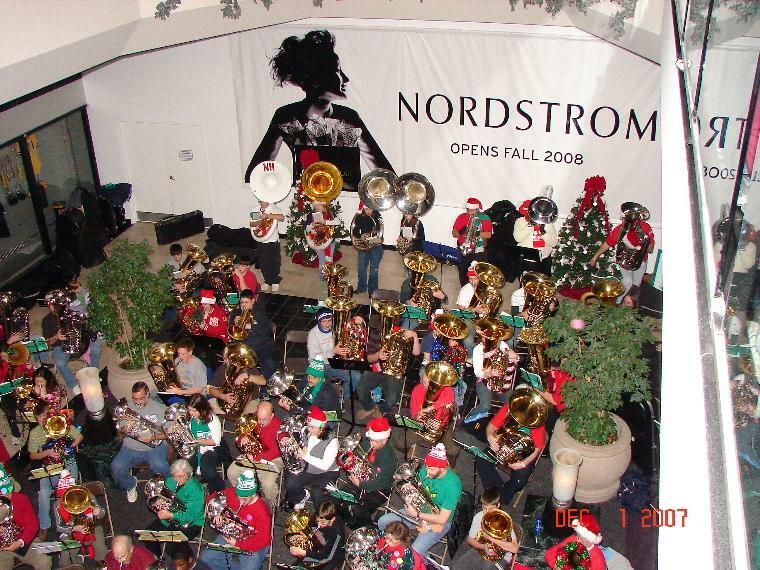 Registration fees help cover increasing production, promotion, and administrative costs for TUBACHRISTMAS. MUSIC: CAROLS FOR A MERRY TUBACHRISTMAS is available at registration: 6 x 8 1/2, bass clef-C, four part score form, or treble clef-Bb, two upper parts, $20.00. Large version 8 1/2 x 11 bass or treble, $25.00. Music contains 33 selections, including numbers arranged by Norlan Bewley to enhance the original nineteen traditional Christmas carols arranged by Alec Wilder. Also available in advance only by mail, via participant order form (6 x 8 1/2 upper parts for treble clef tubas, Eb/Bb, Salvation Army, British Brass Band players). IT IS IMPORTANT TO HAVE A GOOD SOUNDING CHOIR. Since rehearsal time is always limited, getting and preparing the music in advance greatly improves the musicality of every performance. To order music in advance see order form. Allow time for delivery. If you already have a copy from a previous Tubachristmas, No Need To Purchase another. NOTE: Bring folding stand/lyre, dress in bright festive colors and decorate your instrument. Matteson/Phillips TUBAJAZZ CONSORT, along with TubaChristmas's Own Harvey Phillips.